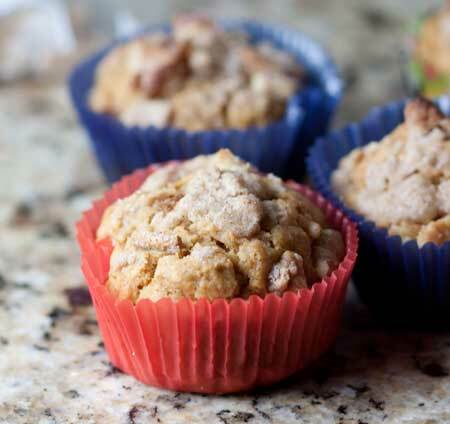 Muffin with flavors of maple and pumpkin. Preheat oven to 400 degrees F. Spray 16 muffin cups with flour-added baking spray or line with paper liners. In a large bowl, combine the flour, baking powder, pumpkin pie spice and salt. Stir well, then stir in the brown sugar. In a second bowl, combine the buttermilk, butter, syrup, pumpkin, egg and vanilla. Add to the dry ingredients and stir just until mixed (don't over-beat). Fill muffin cups two-thirds full. For topping, combine the flour, sugar, nuts and cinnamon; cut in butter until crumbly. Sprinkle over batter. Bake for 16-18 minutes or until a toothpick inserted near the center comes out clean. Cool for 5 minutes before removing from pans to wire racks.